For the final installment in my Superhero showcase, I want to focus on real life superheroes ~ the men and women who put their lives on the line every day as police officers and firefighters. 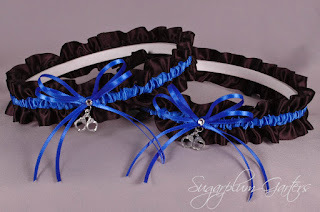 I originally made this Thin Blue Line garter set honoring police officers as a custom request, and it quickly became a best-seller. 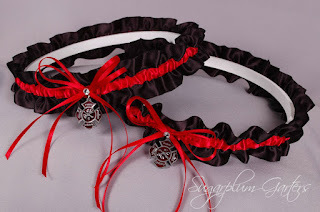 I added the Thin Red Line garter set for firefighters a few months ago after searching far and wide for Maltese cross charms ~ aren't they perfect?!? 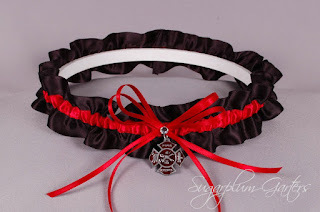 If you've purchased either of these garters or garter sets from Sugarplum Garters, I would love to see pictures! 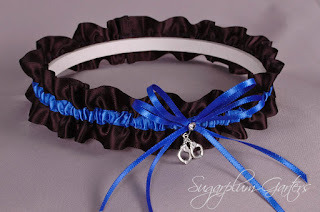 The Thin Blue Line wedding garters is available for purchase on my website here; the Thin Red Line wedding garters are here. I hope you have enjoyed this week's showcase as much as I have, and please let me know if you think there is a special superhero I need to add to my collection!